Micah Christensen grew up in Cheyenne, WY. He earned an associates degree at Casper College before attending Arkansas State University to complete his bachelor's degrees in Communications and Political Science. He has a strong passion for legal energy issues in Wyoming and public lands. Micah began his first year of law school while also serving as a campaign manager for Representative Cynthia Lummis. 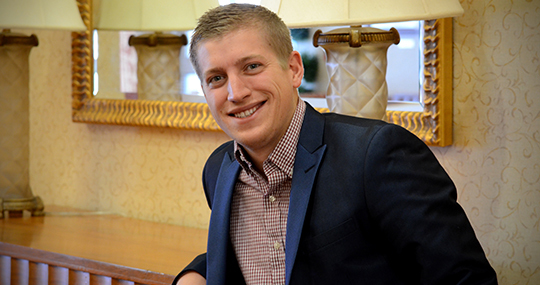 Micah was drawn to the University of Wyoming College of Law because of the strong energy programs and the range of experiential opportunities provided. He says, " The University of Wyoming College of Law is a great fit for my passions and career goals. I hope to someday be on the frontline of protecting Wyoming's great places and the western way of life." During his law school career, Micah has been extremely active in the Davis and Cannon Energy Moot Court Competition, advancing to regional competitions. He represented the College of Law in both the PACE Environmental Moot Court Competition in White Plains,NY, and the Energy Law Negotiations Competition in Houston, TX, where he made it to the final rounds. He is also the president of the Wyoming chapter of the Federalist Society, and a member of the Natural Resources Club. Micah was extremely honored to be selected as the student director for the EENR Clinic.